Each year, as part of the celebration of the life and achievements of Martin Luther King Jr., Carnegie Mellon University holds the Martin Luther King, Jr. Day Writing Awards, which highlights writings by students in the Pittsburgh area on their experiences with discrimination. In acknowledgement of the awards’ impact, Mayor Bill Peduto has declared Monday, Jan. 15, 2018 as the day of the Martin Luther King, Jr. Day Writing Awards Celebration in the city of Pittsburgh. WHEREAS, of the 83 contributors, approximately 40 are graduates of the Pittsburgh Public Schools and about 30 are CMU alumni. Since its inception, CMU’S MLK Day Writing Awards have received more than 2,000 entries from the Pittsburgh region. NOW THEREFORE BE IT RESOLVED that I, William Peduto, Mayor of the City of Pittsburgh, do hereby declare January 15, 2018 the “Martin Luther King, Jr. Day Writing Awards Celebration” here in our most livable City of Pittsburgh. The awards ceremony will take place Jan. 15 at 4:30 p.m. in CMU’s Rangos Ballroom in the Cohon University Center. The Martin Luther King, Jr. Day Writing Awards are sponsored by CMU’s Dietrich College of Humanities and Social Sciences, Department of English, the Center for Student Diversity and Inclusion and UPMC. 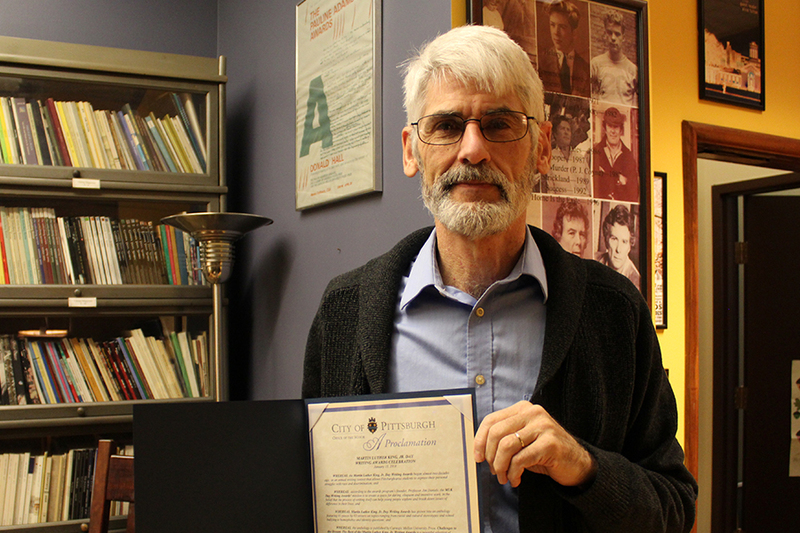 Pictured above: CMU professor and founder of the writing awards, Jim Daniels poses with the mayoral proclamation.